Since 2003, the United States has spent about $8 billion to train, staff, and equip Iraqi police forces to maintain domestic order and deny terrorists a safe haven within Iraq. Within DoS, INL is responsible for developing policies and managing programs that strengthen law enforcement and other rule of law institutional capabilities outside the United States. In 2003, INL was assigned initial responsibility for the Iraqi police training program and funded it. The Department of Justice’s International Criminal Investigation Training and Assistance Program was also involved. However, program responsibility was transferred to DoD in 2004 due to the Iraq security situation, the scale of the task, and the need to ensure unity of command and effort. Specifically, on May 11, 2004, National Security Presidential Directive 36 assigned the mission of organizing, training, and equipping Iraq’s security forces, including the police, to the U.S. Central Command, until the Secretaries of State and Defense agreed that DoS should take on that responsibility. INL has not currently assessed Iraqi police capabilities to the extent necessary to provide a sufficient basis for developing detailed program tasks and an effective system for measuring program results. Over two and-a-half years ago, a Joint Transition Planning Team made a three-week visit to Iraq to gain a baseline understanding of Iraq police forces’ capabilities, but noted that a number of follow-on steps would be required for program design. However, the follow-on steps for program design were not accomplished and a planned 2011 baseline assessment was not completed. In October 2010, SIGIR raised concerns that DoS would be assuming responsibility for a program to advise and assist Iraqi police forces when the capabilities of those forces had not been assessed in any comprehensive way. We reported that neither DoD nor DoS has fully assessed the capabilities of the Iraqi police. DoD carried out some assessments, but they have limited usefulness in evaluating the current capabilities of the Iraqi police services. SIGIR recommended that the Commanding General, U.S. Forces-Iraq, in consultation with the Assistant Secretary, INL, work with the MOI to help assess the capabilities of the Iraqi police and provide that assessment to INL. Although U.S. Forces–Iraq agreed with the report recommendation, the assessment was not completed. The simplest explanation for why so many groups refuse to complete the task of assessing the capabilities of Iraq’s police forces is that the result is not one they wish to publish. The refusal to publish an assessment of Iraqi police capabilities, coupled with the DoS plan to rely on mercenaries rather than on the “trained” forces, can only lead to the conclusion that Iraq’s police forces cannot be counted on to function at a level that would protect DoS activities in Iraq after withdrawal of US troops. Now that the most reasonable assumption is that US efforts to train security forces in Iraq have failed, it is notable that the Washington Post’s article today is missing one key piece of background. Since the handover of the training program to DoD in 2004, every time there have been claims about how well things were going in Iraq and/or how many security forces were being trained, the press has been careful to credit David Petraeus as being the driving force behind such efforts. 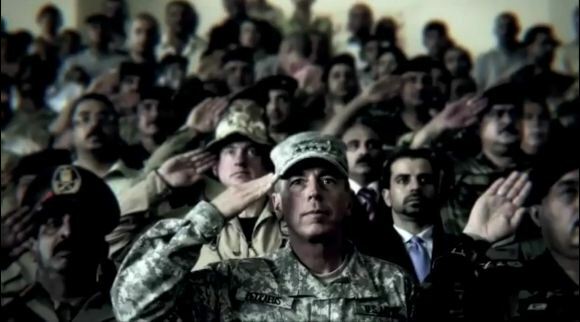 In fact, one of the first times Petraeus burst onto the national scene was when in September, 2004 the Washington Post carried an op-ed from Petraeus in which he was allowed to make grandiose claims about progress in training Iraqi security forces. Later, in September, 2007, the kerfluffle over Move-On’s “Betrayus” ad diverted attention from the fact that during his testimony on the effectiveness of the “surge”, he was effectively starting over on training of Iraqi security forces, with his “progress” from 2004 having been wiped off the books and out of Washington’s memory. There was one ABC News report in 2005 that actually mentioned failures in Petraeus’ efforts training Iraqi police, but this particular report is very much in the minority. Will any press reports this week manage to connect Petraeus’ name with the failure in training security forces in Iraq? Don’t hold your breath waiting. meh, do all these contractors get diplomatic immunity by being attached to state? @tw3k: Good question. You can at least bet they will be protected by the US with the same enthusiasm as Raymond Davis and the unknown bystander-killing driver were in Pakistan. @tw3k: The answer ought to be a resounding “No!” But I think a remnant of the status of forces agreement protects them. After 2011, I assume their claims for continuing immunity will flow from diplomatic agreements. The historical basis for those claims of immunity – the sort of immunity foreign governments claimed for their troops in China around the time of the Boxer Rebellion – is usually that the conduct of their forces is governed by a credible alternative to the whims of local law. Based on the US’ refusal to apply its own laws to these mercenaries, its refusal to allow its DoJ to investigate and prosecute their wrongdoing, a reasonable conclusion is the same one would draw with regard to domestic telecoms providers. The object is simply immunity, immunity from law, immunity from legal and political consequences for criminal acts. That’s a hallmark of the Obama administration even more so than its predecessor.